A fine ruckman/forward whose career was blighted by injury, Andy Bennett enjoyed a brief but brilliant playing career in Tasmania, however, it would be his performances as a coach at both club and state level that would cement his legacy in the annals of Tasmanian football. 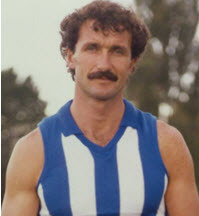 Born in 1955, Andy Bennett had played senior football in his home town of Broken Hill before being signed by SANFL club South Adelaide as a 20-year old in 1975. Not one of the most successful SANFL teams, Bennett featured in the Panthers’ rare Grand Final appearance in 1979, the same year he represented South Australia at the first of two State of Origin carnivals. Recruited to the VFL by Hawthorn in 1980, Bennett played 16 games in his first season with the Hawks, but managed just five games in the next four years due to persistent and ruinous injuries. After a change of scenery to St. Kilda in 1985 improved his fortunes slightly (14 games), Bennett relocated to Tasmania ahead of the 1986 season to coach Sandy Bay, becoming the Seagulls inaugural coach in the Statewide competition. Finally rid of the injuries that had ruined his VFL career, Bennett’s class as a player shone from his first game with Sandy Bay. In his first season, he won the William Leitch Medal as the state’s best and fairest player, won Sandy Bay’s club champion award, represented Tasmania three times in interstate matches and guided the Seagulls to the minor premiership and first Grand Final appearance in eight years, where they unfortunately lost to Glenorchy. His good form continued the following year, although faced with a mass exodus of players Sandy Bay struggled, winning only five games and finishing the season second-to-last. After a much-improved effort in 1988 which saw the Seagulls back in finals football, although ultimately suffering a disappointing straights sets exit, Bennett returned to South Australia in 1989 to serve as the final coach of the Woodville Football Club before their merger with West Torrens at the end of 1990. After losing out on the Woodville-West Torrens job, Bennett returned to Tasmania and to Sandy Bay in 1991, this time as a player only. This move would be his last as a player, with Bennett retiring half way through the 1992 season after sustaining a serious facial injury. He spent the rest of the season riding the boundary for ABC TV’s TFL match broadcasts. In 1993 Bennett was appointed coach of North Hobart, leading the Demons to a preliminary final in his first year at the helm. His second season was less prolific, and he stepped down as coach at the end of 1994, to return to TV commentary with the ABC, as well as taking up the role of coach of Tasmania’s state team. In four matches in charge from 1995-98, Bennett guided Tasmania to memorable wins against VFL, SANFL and WAFL representative sides, in the process confirming the TFL’s place as the premier state competition in the country outside the AFL. After one more assignment as coach of the Tassie Mariners for their 2000 National Under-18 Championships campaign, Bennett stepped aside from coaching permanently. He remained involved with the game for another 10 years with the ABC, calling Tasmanian Devils VFL games as well as games for the newly reformed Tasmanian State League. By the time the ABC ceased live TSL coverage after the 2010 season, Bennett had spent a combined 17 years on air covering the pinnacle of Tasmanian football.